Egypt’s ministry of antiquities says dozens of cat mummies and around 100 wooden, gilded cat statues were unearthed in recently discovered 6,000-year old Pharaonic Age tombs. The find also turned up a collection of statues of other animals including a lion, cow and falcon. The seven tombs were discovered by an Egyptian archaeological mission at Saqqara, in a cemetery in what would have been the ancient city of Memphis, south of Cairo. The excavation mission which uncovered the tombs started April. While three of the tombs have been explored, four others remain unopened. Cats were particularly revered as divine creatures in ancient Egypt. Several Egyptian deities, including Bastet — the goddess of cats, have been depicted and sculptured with feline features. 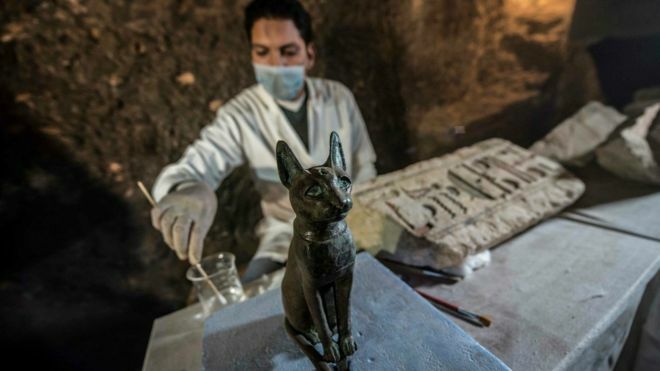 A bronze cat statue of Bastet, pictured above, was also uncovered in the recent find.) Cats were often mummified and buried alongside ancient Egyptians based on mythology that they provided the dead with pets and food in the afterlife. Egypt has notably publicized many of its recent archaeological finds in the hope of stirring tourist interest following a dip in tourist visits since mass protests overthrew long-time ruler, Hosni Mubarak, in 2011. In its Facebook announcement post, Egypt’s antiquities ministry noted there’s private sector interest “to develop archaeological field and sites and to show the exceptional richness of the Egyptian civilization” as well as “attract the attention of the world.” Egypt’s other major finds over the past year have included the “most ancient archaeological solid residue of cheese” and a 2,000 year old cemetery. In other Egyptian news, an article on Tuesday in The National shed light on the issue of mental illness and suicide in Egypt. In early September, a man died by suicide after jumping onto the tracks in front of an oncoming train at a Cairo Metro station. In response, the country’s Metro authority warned commuters not to kill themselves in such a manner because it would be an inconvenience to the public. Public services are severely underfunded and medical professionals often lack adequate training in mental health. According to the article, the shame and stigma surrounding the issue means that mental illness is misunderstood and discussed. 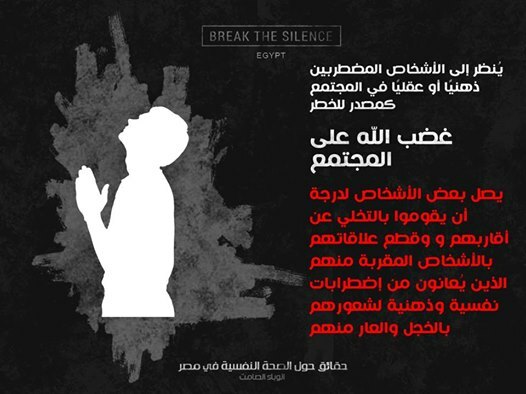 It is unknown just how prevalent mental health problems and suicide are in Egypt because many people are unwilling to admit to having a problem, but a nationwide survey carried out in April by the Ministry of Health found that 25 per cent of Egypt’s population was suffering from some kind of mental health problem. “Being depressed [doesn’t mean being] terminally ill but if you have a mental health issue and you go to Abbasiya [a mental health hospital in Egypt] or something, someone’s father won’t allow me to marry their daughter,” explained Ally Salama, who started the Facebook page Break the Silence Egypt to open a conversation about the issue among young people. The Facebook page shares factual information about mental illness and attempts to make people feel comfortable talking openly and honestly about it. In northeastern Morocco on Tuesday, three people were killed and three others were injured when a zinc and lead mine collapsed. The collapse happened in a region already shaken by protests over similar accidents, including another a week earlier in which two people, including a teenager, died in a collapse of abandoned mines. Hundreds of miners in the province of Jerada continue to risk their lives in abandoned mine shafts to extract coal. The area has been hit by social unrest and peaceful protests since the December 2017 deaths of two brothers trapped in a mine shaft that was shortly followed by another two deaths under similar circumstances. Tuesday’s accidental deaths took place in the small community of Ras Asfour in a mine that was operating with an official permit, unlike previous ones. Moroccan authorities have pledged a series of measures to revive the the economy in the province, one of the poorest in Morocco according to official statistics, and have vowed to close all abandoned mines. Protests are common in Morocco’s economically-depressed regions. The leader of protests over economic and social problems in northern Rif region was sentenced to 20 years in prison in June, provoking outrage among his family and activists. A court in Casablanca convicted the protest leader, Nasser Zefzafi on charges of undermining public order and threatening national unity after organizing demonstrations in his hometown Al Hoceima in response to the death of a fishmonger. Also on Tuesday, President Trump has nominated retired Army General John Abizaid to be the U.S. ambassador to Saudi Arabia. The position has been vacant since the beginning of Trump’s term. This nomination comes in the wake of spiked tensions between the two nations over the murder of Jamal Khashoggi in the Saudi consulate in Istanbul. During the discussions surrounding the killing, Trump’s son-in-law, Jared Kushner, has taken on some ambassadorial duties, such as speaking with the royal family on behalf of the United States. Trump’s decision to nominate a former army general underscores his administration’s emphasis on the military dimension of the U.S.-Saudi alliance; Trump has emphasized his intention to continue a planned arms deal with the Saudis, while simultaneously promising “severe consequences” in response to the kingdom’s role in Khashoggi’s death. Abizaid is a four-star general with a master’s in Middle Eastern area studies from Harvard University. He was the longest serving member of Central Command. Spotify has launched its popular music streaming service in several countries across the Middle East, including the United Arab Emirates, Qatar, Morocco, Algeria, Egypt, Tunisia, Lebanon, Jordan, Oman, Saudi Arabia, Bahrain, Kuwait and the Palestinian territories. The popular service has been available in Israel in May. Spotify is already popular among users in the Middle East who have accounts that are tied to other countries that have had the streaming service for longer. Middle Eastern listeners will have access to the same content that is available in the US and UK, and Spotify will also be adding more Arabic music and creating playlists for the Arab world. Michael Krause, Managing Director for Spotify in Europe, the Middle East, and Africa, told the BBC that content targeted towards Arabs will be available globally to appeal to Arabs living outside the Middle East, as well as any other Spotify customers who might be interested, potentially boosting the popularity of Arabic music: “Maybe the next Despacito or other global hit might come from the Arab region – which would be quite exciting.” Spotify will have to compete with the numerous other streaming services, such as Apple Music and Deezer, which are already available in the region.